They say most people are either left brained or right; meaning while some people are creative, others are scientific. I consider myself pretty lucky because I have the best of both worlds. My boyfriend is a biomedical engineer and I am a graphic designer/printer. He has been so amazing and helpful and really has been an intricate part of this company. Yesterday, he bought me a digital vernier caliper because I didnt have one and thought it would be useful in the press shop. It turns out that he was right (don’t tell him I said so!) and I now love using this tool. It allows me to measure everything from paper thickness to type high and so many other things. The best part about the caliper is that it is digital and super precise. If you want to know more about this tool, I have added some additional information and some pictures of my caliper. Whether you have a small or large press shop and do not have a caliper, I highly recommend that you get one. A refinement now popular is the replacement of the analog dial with an electronic digital display. This version of the caliper allows reading the value directly from a single display. Many digital calipers can be switched between metric and imperial units. All provide for zeroing the display at any point along the slide, allowing the same sort of differential measurements as with the dial caliper but without the need to read numbers that may be upside down. 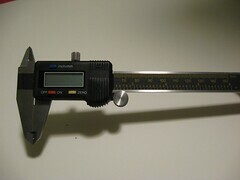 Digital calipers may contain some sort of “reading hold” feature, allowing the reading of dimensions even in awkward locations where the display cannot be seen. With all of these benefits, digital calipers have by no means replaced the dial caliper. Digital calipers typically do not have the beam structure of a dial or vernier caliper and therefore do not have the repeatability or accuracy to an amateur user. Dial calipers have the potential to last much longer with their repairability. 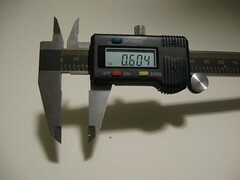 Increasingly, digital calipers offer a serial data output to allow them to be interfaced with a personal computer. This means measurements can be taken and instantly stored in a spreadsheet or similar piece of software, significantly decreasing the time taken to take and record a series of measurements. The output of non-name brand calipers is usually 24 bit 90 kHz synchronous. A suitable interface to convert the output to RS232 levels and format can be built or purchased. Both dial and digital calipers can be used with accessories that extend their usefulness. Examples are a base that extends their usefulness as a depth gauge and a jaw attachment that allows measuring the center distance between holes. Digital calipers contain a linear encoder. A pattern of bars is etched directly on the Printed circuit board in the slider. Under the scale of the caliper another printed circuit board also contains an etched pattern of lines. The combination of these printed circuit boards forms two variable Capacitors. As the slider moves the capacitance changes in a linear fashion and in a repeating pattern. The two capacitances are out of phase. The circuitry built into the slider counts the bars as the slider moves and does a linear interpolation based on the magnitudes of the capacitors to find the precise position of the slider. Definition & Diagram from Wikipedia.